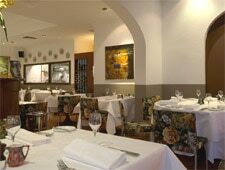 Exuberant Italian hospitality and memorable dining. : Chef-owner Armando Percuoco’s charm and energy pervade this Italian restaurant. Channeling the best of Naples, Buon Ricordo has been hosting visitors for decades. While the building hints of Italia, it gives no indication as to what awaits beyond its doors. The place has carved out a faithful clientele, and they come to enjoy “la vera cucina,” which Percuoco translates as “unabashedly true Italian cuisine,” and it’s not unusual to see him bounding out of the kitchen to greet guests. The menu’s signature dish of fettuccine tossed at the table with truffled egg keeps people returning, as does Milly Hill lamb shoulder braised with sheep milk ricotta, mint and lemon zest, or deboned whole baby snapper stuffed with capers, olives and breadcrumbs with Sicilian salmoriglio dressing. Those in the know hope to finish their meal with the feather-light apple mille mele (a thousand slices) or at least a selection of fine Italian and Australian cheeses. If you know Italy and the wines of its regions, the wine list will lead you straight to your favorites.